You probably know that it is easier to sell to an existing customer who knows and likes you than to find new customers. Keep coming up with new things to help the customers who already trust you and want to buy from you. My business model is, “Learn it, do it, teach it.” I have built my business on helping my customers to do what I have done. When I discover something interesting, I research to learn how to do it, I do it, then I teach it to my customers. That can make it easy to come up with new product ideas, because as you keep exploring and learning new things you can bring your customers along on your journey. Another way to determine what your customers want from you is to ask them. You can do so in a formal way by running a survey, or you can toss a question out to your followers on Twitter or Facebook and see what they suggest. Does it seem that your market is getting smaller or overcrowded with competitors who are driving prices down? Maybe it is time to expand into a new market. Is there another group of people who are a logical extension of your current market? For example, if you are currently selling to massage therapists, maybe other holistic and alternative health providers would also be interested. Your product or service will probably need some reworking for the new market, but the reworking is probably more of a tweak than rebuilding from the ground up. One of my favorite stories about finding a new market is about the Plano Molding Company. They make tackle boxes—you know, those plastic cases with lots of little compartments that fisherman use to store their hooks, lures and other doo-dads. When the company learned that women were buying their tackle boxes to store their makeup, they launched a new line of boxes in bright colors, some with mirrors inside. You may know them as Caboodles. That is an example of a company paying attention and grabbing an opportunity. Do you have products and services at a variety of price points? If all you offer is a consulting package that starts at $2500, you may be missing a lot of chances to bring in new customers at lower price points. That doesn’t mean you should lower your consulting prices, but consider offering other products—webinars, an online course, books or other products—at lower price points. This gives new customers a way to sample what you offer without a large commitment and allows you to serve a larger group of people. Most of the people who buy your lower-priced products will never buy the high-end service, but that’s OK. Some will, and you make passive income from the buyers of those products. Be on the lookout for new product ideas at all times. When you get questions from clients or others, consider whether that question might be a great idea for a new product. 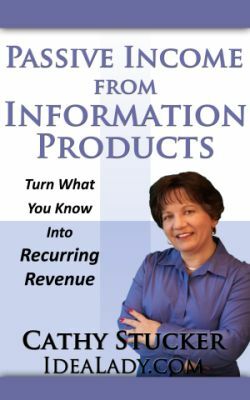 Some of my most profitable products were created because I listened to my clients. Save email questions you get to an Ideas folder. Add ideas that come from other sources, such as articles or blog posts you read, conversations you overhear and what you notice is missing from other products on the market. Go to the folder at least every couple of months and look for your next product idea. Expanding your product and service offerings should be an ongoing process. The benefit will show up in your bottom line. Want to discover more about creating passive income with information products? Get my new Kindle book and free bonus audio here. I like the idea about listening to your clients. I too have created products simply because I noticed clients kept asking the same questions. Instead of answering the question every single time it was asked, I was then able to direct them to something that saved my time and energy. The caboodle story is great too. I didn’t know that was why they were created. Great idea! Thanks for the post and good luck with the new book.